Long pile or third generation pitch surfaces have been used for football training at all levels for many years in the UK. Increasingly they are being installed for rugby training pitches and for multi-sport applications. Since their mainstream introduction almost a decade ago, yarns and carpets have been developed to replicate natural turf and provide the highest levels of comfort and safety. Bernhard's offer the very finest surfaces, from 40mm pile height for football and recreational hockey to 70mm pile height for rugby and football use. Many 3g surfaces can be installed without a shockpad and will conform to the appropriate performance requirements demanded by the relevant sports. 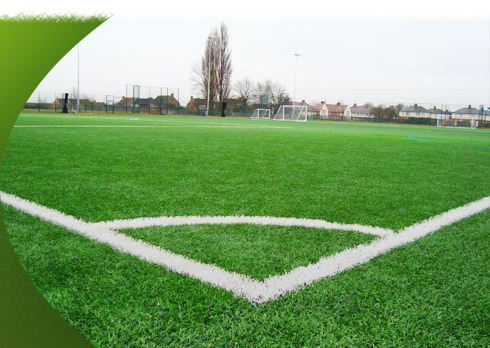 However, to meet the standards set to satisfy the demands of the echelons of sport, a shockpad may be required between the grass carpet and the pitch base. We offer a comprehensive range of shockpads to complement our carpets and help produce the exact performance criteria you require for your facility. The shockpads are designed to support multi-sport use without compromising the primary sport and to comply fully with the performance requirements of the relevant governing body. Our preferred base specification is engineered with a suitable raft of granular material and two layers of open textured tarmacadam. However, many 3g surfaces can be successfully installed onto a carefully constructed dynamic (no binding layers) base. As with all of our installations, the civil engineering element of the facility will be designed specifically for you, having considered all the site characteristics.